Comments: Gyrfalcons are the largest of all falcons. They are strongly dimorphic in size with males weighing about 65% of the female’s weight. Plumages range from nearly white to dark brown with various degrees of streaking and barring. They do not have the distinct facial pattern seen in most other falcons. 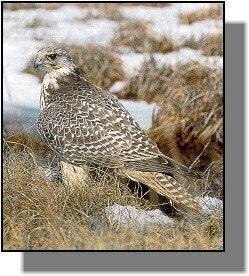 Distribution: The gyrfalcon is the only diurnal raptor that inhabits the extreme northern habitats of the arctic. It is a rare occurrence for a gyrfalcon to come as far south as Kansas, but in recent winters several have been seen. Food: Ptarmigan are the most important prey for gyrfalcons. They will also take a variety of other birds ranging in size from large waterfowl to smaller passerines. Occasionally they will catch hares, lemmings and ground squirrels. Gyrfalcons depend on speed and sustained pursuit to capture their quarry.